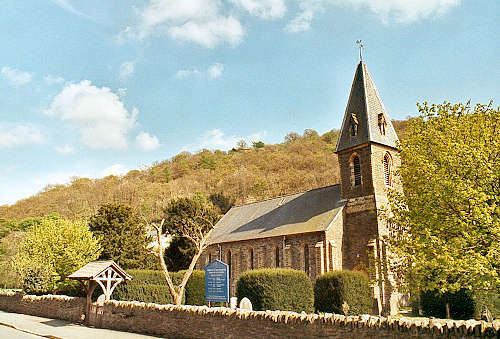 The new parish of Pontfadog was formed on 15 April 1848, from the ancient parish of Llangollen. It comprised the whole of Glyn Traean - i.e. the townships of Cilcochwyn, Crogen Iddon, Crogen Wladys, Erwallo, Hafodgynfor, Nantygwryd, Pennant and Talygarth; together with the township of Cysylltau from Llangollen Traean. However, Cysylltau returned to Llangollen in 1870. The church of St. John the Baptist was consecrated on Thursday, 7th October 1847. For family history information about the church and parish, visit the GENUKI Pontfadog page.